I do not know why but the smell of baking yeast cakes just fills me with warm loving feeling, it is so wonderful. 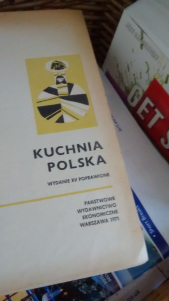 Yeast cakes feature greatly in Polish festivals and there is Babka for Easter, Makowiec (Poppy seed roll) for Christmas Eve and doughnuts before the start of Lent and New Year’s Eve and Epiphany. Surprisingly my mother did not seem to have a great success with yeast cookery, maybe her kitchen was a bit cool, I do not know. We got our yeast cakes from her friends. I have done lots of experimenting with yeast recipes and have had a lot of success (and some failures from which I also learnt much!). I now know that you can succeed in a cool kitchen; you just have to start a day beforehand. Watching the yeast rise still seems like magic to me even though I am well aware of the science that makes it happen. It can be unpredictable and depends on the yeast and the temperature. I prefer to use fresh yeast but cannot always get it, so now I use dried yeast and also get good results. I have used the type of yeast that you add straight to the flour but I like to see that the yeast is active before it goes into the flour so this is not my favourite type – but I have to admit is does work in many recipes. Many recipes use a batter starter and I like this method as you can see the yeast making the mixture really rise. The best time to make a yeast cake is on a day when you are in and doing other things as the times for rising and proving can vary, you have to be around and do the next stage when the time is right, you cannot rush it. One of the drawbacks with yeast pastry is that the cakes go stale very quickly so you need lots of people on hand to help to eat it all. Poppy seeds are the blue-grey seeds of the poppy – Papaver somniferum. They have been used since antiquity and were known in Egyptian, Minoan and Sumerian cultures. They are used in European and Middle Eastern cooking and are especially popular in Jewish and in Polish cooking. 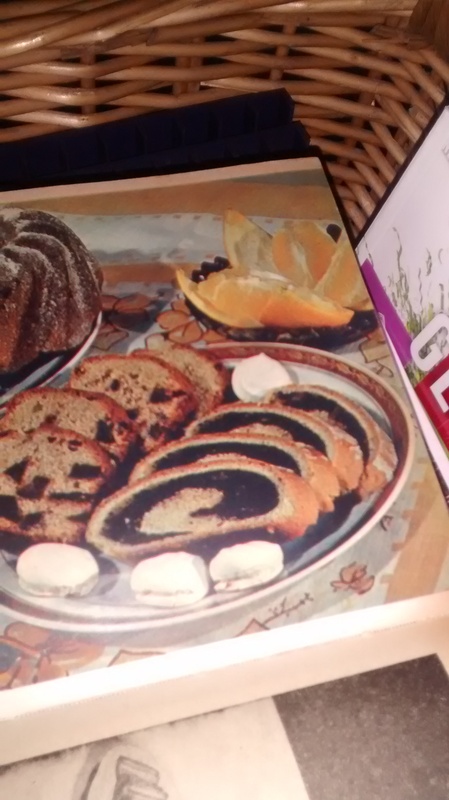 Mak is the Polish word for poppy seed and a cake made with poppy seeds is called makowiec. This is one of the dishes served on Christmas Eve and I will be writing about the food for that evening later in the year. This classic yeast cake is served on Christmas Eve. Poppy seeds and honey are used to make a filling which I think is just so delicious. Some fillings also use dried fruits such as raisins but I prefer it without. I have been searching for many years for the best recipe for this cake and I think I now have it. Many recipes that I have tried, have made a cake which is so large that it has tried to escape out of the baking tray and the oven and I have been experimenting to get an amount which is more suitable for the standard size oven in the United Kingdom. Also the shape of a nice roll of cake has eluded me till now, mine seemed to rise too much and crack and spread across the baking tray with all the filling escaping! On a visit to Poland I was given a suggested that you wrap the rising yeast roll in greaseproof paper to keep its shape and this worked. So at last I have the size and shape that works well. Without a doubt this recipes is time consuming – so in my next posts I will give some easier simpler variations which are also delicious. There are 3 parts to the making of this cake: the poppy seed filling, the yeast pastry and the icing. I make the poppy seed filling first, or during the time the yeast is rising, as it has to be cool when used. You can make the filling ahead of time – there are several stages where you can leave it to finish later. I often make till until the addition of the butter and add the rum and egg just before I need it. You can also freeze this filling at this stage. Put the poppy seeds and milk into a saucepan and simmer then together for 30 minutes, stirring occasionally to stop any sticking or burning. The aim is to cook the seeds and adsorb as much of the milk as possible. You need to watch this carefully and keep adjusting the heat to stop the mixture burning. 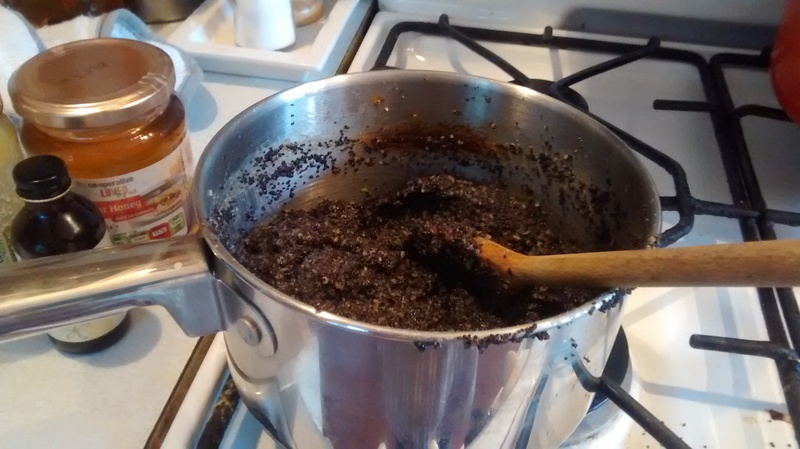 Using a fine sieve, strain the poppy seeds from the liquid – leave this for a while to remove as much liquid as possible. 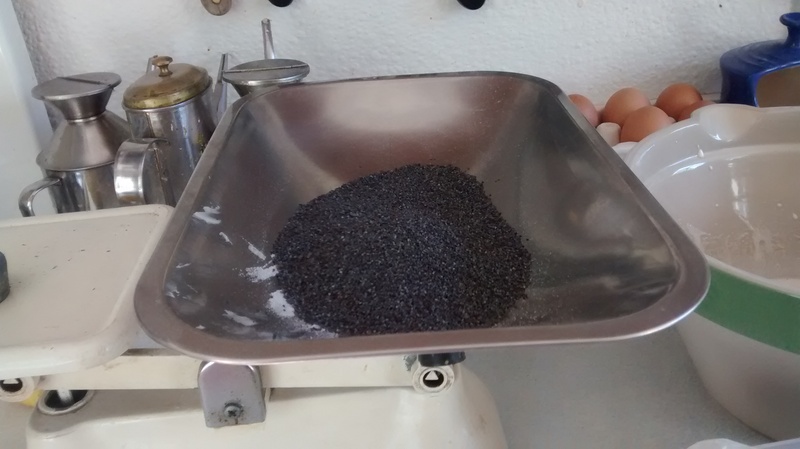 The poppy seeds need to be crushed, I use a hand held blender for about 5 minutes which I find is the easiest way but you can use a pestle and mortar or a mincer. Once crushed, place the poppy seeds back into a saucepan and add the ground almonds, the vanilla essence and the 120ml of honey and mix thoroughly. Add the butter to the mixture and simmer gently for about 5 minutes and then leave this mixture to cool completely and then add the rum. Whisk the 15ml (1 tablespoon) of honey with the egg yolk until this is thick and creamy and then add this to the mixture. Just before you need the filling, whisk the egg white until it is stiff and then fold this egg white into the poppy seed mixture. Mix the ingredients together in a bowl then cover this with a tea towel or cling film and leave the bowl in a warm place for 3 hours. After this place the bowl in the fridge – you can leave this overnight. Warm the milk slightly and put it into a large bowl, add the yeast and sugar and leave in a warm place for 15 minutes or until you can see that the yeast is active and rising. Add the starter, the egg and egg yolks, the pinch of salt and the flour. Mix and then knead the dough until it forms a soft ball. Cover the bowl with a tea towel or cling film and leave for 15 minutes. Add the butter in tablespoonful amounts to the dough, kneading slightly at each addition and then knead the dough for 10 minutes. The dough should be soft and elastic but not sticky, if it is too sticky add some more flour knead till it is the correct texture. Place the dough into an oiled bowl and cover with a tea towel or cling film and leave to rise. Have ready a greased baking tray as the size of rectangle of dough you need is governed by the length of the baking tray. When the dough is ready, roll it out into a rectangle of around 20cm by 25cm. It will be about 1cm in thickness. Place the filling onto the dough leaving about 2cm clear at all the edges. Roll up the poppy seed roll lengthwise and then enclose the roll reasonably tightly lengthwise in greaseproof paper, do not cover the ends of the roll which will rise and expand lengthwise. Place the roll onto a baking sheet with at least 5cm at each end to allow for the expansion and leave this to rise for about 1 hour. Place the risen roll into the oven with the greaseproof paper still on. Bake for about 40 minutes and then cool on a wire rack, remove the greaseproof paper as soon as the roll has cooled slightly. 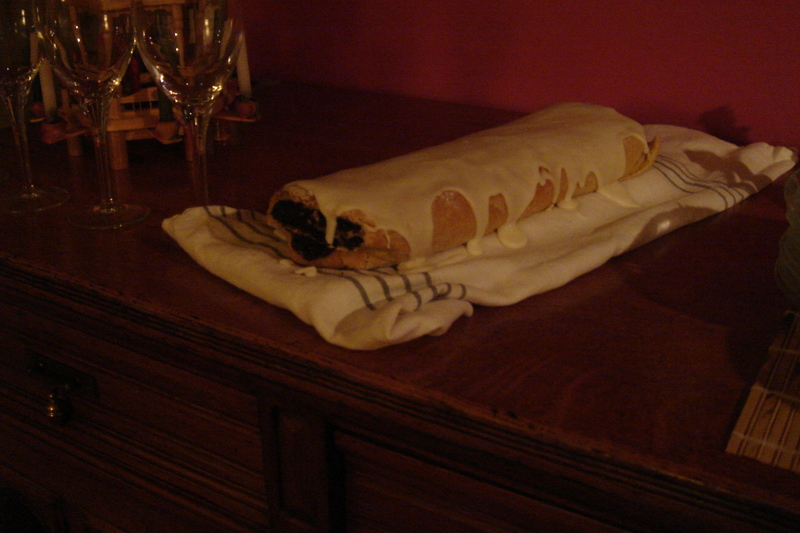 Before serving dust the roll with icing sugar – or you can glaze it with a thin lemon icing. I cut the short end of the roll off and do not serve these. The amount of icing sugar you need will vary, depending on the size of the lemon and the dampness of the sugar. Place the lemon juice in a bowl and slowly add the sugar mixing it with a wooden spoon is best, use more or less sugar to make a soft runny icing which will coat the back of the spoon. So that is the end of my first recipe, which does take quite a while to make but I felt I had to include this traditional version especially now I have mastered it. There are many other poppy seed cakes and I will be continuing next with a few of these. They quicker and easier to make but are still very delicious and also a few recipes for poppy seed cakes which have evolved from these. These recipes are really good and easy to follow. I have tasted results from this kitchen and they are delicious!